In the 40 years since China opened its economy to the world, its population has experienced dramatic changes in their living standards – not least due to the urbanization and industrialization that followed. Economic opportunities significantly deepened as China became a supply chain hub for most of the world’s manufacturing processes. With that growth, the size of the country’s middle class expanded in kind. The World Bank has ranked China as an ‘upper middle income’ country; its gross domestic product per capita income was US$8,827 in 2017. Now, amid an economic slowdown and stuck in a trade war with the US, China is depending on its middle class to stabilize domestic growth by spending more. So, we ask five simple questions to better understand the size and economic power of China’s middle class. 1. 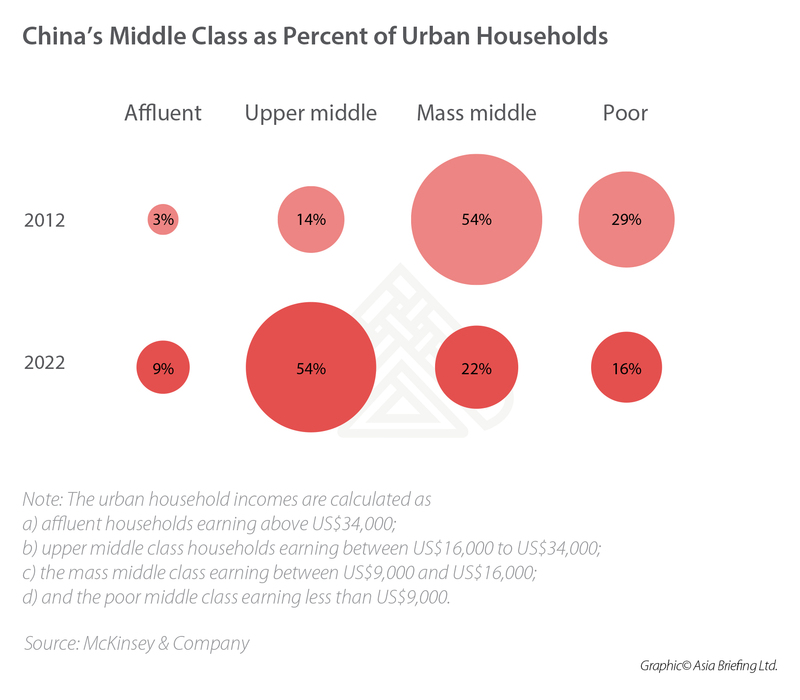 What is the size of China’s middle class? Current estimates put the size of China’s middle class at 400 million people or 140 million households. This is less than one-third of China’s total population. Among them, the urban affluent population is concentrated in the eastern and coastal provinces that witnessed rapid growth as China invested in developing local industries and supply chain logistics capabilities that could connect easier with the rest of the world. In comparison, the middle class cohort constitutes half of the US’ population and two-thirds in South Korea. Consequently, Beijing is keen to expand its middle class population through tax reforms and by increasing disposable incomes. This includes raising the tax-free threshold from RMB 3,500 (US$516.70) to RMB 5,000 (US$738.14) a month and adding new deductions, such as for parental aged care, housing mortgage costs, education costs, and healthcare costs, among others. 2. What is their median income? According to official data, a middle class household in China earns between RMB 25,000 (US$3,640) and RMB 250,000 (US$36,400) in a year. More recently, the National Bureau of Statistics put out an official definition for the first time, where it stipulated that people earning a monthly income of RMB 2,000 (US$295) to RMB 5,000 (US$740) constituted as ‘middle income’ earners in China. This is far lower than the average in OECD countries. In fact, a 2015 report by the investment banking firm UBS and PricewaterhouseCoopers puts the size of China’s middle class at only about 109 million people – by setting a higher income threshold between US$50,000 and US$500,000. Official Chinese calculations would assign such wealthy Chinese in the ‘high income’ bracket. The National Bureau of Statistics has stated that anybody earning more than RMB 10,000 (US$1,480) a month would qualify as high-income. Again, for the benefit of comparison, we look at how middle class households are defined in the US and South Korea. The US defines middle class households as those earning two-thirds to double the national median income; in South Korea it is 50 to 150 percent. A single-person-middle-income-earner in the US makes between US$26,000 and US$78,000 in a year (as per 2016 data) and a middle-income-three-member-household earns about US$45,000 to US$135,000, according to the Pew Research Center. In South Korea, the median monthly income of a four-person household was KRW 4.39 million won (US$3,928) in 2017. That would mean its average middle class four-person-household would earn a monthly income between US$1,964 and US$5,892. This is still much higher than in China. 3. How fast is the middle class growing? China’s middle class expanded substantially as its urban population grew from constituting 19 percent of its population in 1980 to reach 58 percent in 2017. In 2000, just four percent of China’s urban population was considered to be middle class, rising to over 30 percent in 2018. A study by consulting firm McKinsey & Company projects that 76 percent of China’s urban population will enter the middle income bracket by 2022. Their study defined middle class urban household earnings at US$9,000 to US$34,000 a year. While this range is much lower than in developed countries, when adjusted for market prices, it allows for a comparable middle class standard of life in China. 4. How does the Chinese middle class spend their money? Education, healthcare, elder care, rising debt, and housing costs dominate the spending of hundreds of millions of China’s urban white-collar professionals and private business owners. And, while their fortunes have grown with China’s rise, so too have the costs of living in the cities. 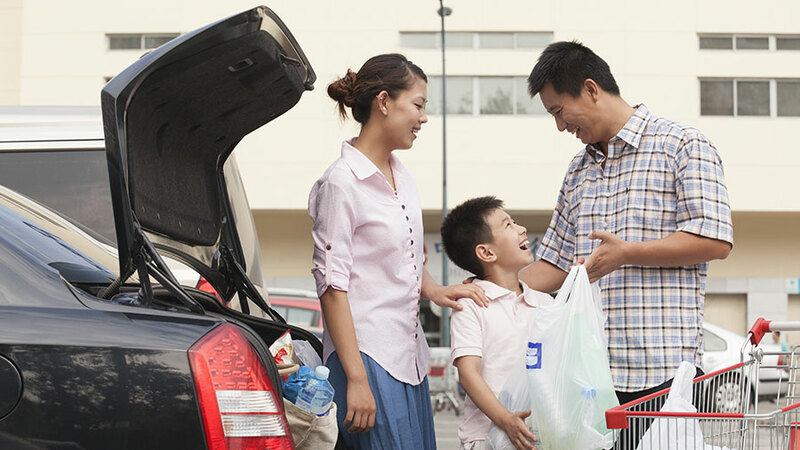 For example, most young Chinese families still depend on their parents for financial support when buying their first car, let alone a home. Young middle class families cut costs by buying goods in bulk and during sales and rarely eat out or travel abroad. Priority is instead given to paying school fees and meeting high tutoring costs. Higher income households also invest on extra curricular activities for their children, such as music or dance lessons, to provide them an edge as they grow older and explore options to study abroad. This is because Chinese parents invest in education as a critical means of stepping up the economic ladder – a much more difficult proposition for the millions who make the move from more interior regions to second and first-tier cities. The stakes can be incredibly high – China’s college entrance examinations see more than 10 million students competing to secure a spot in one of the 150 tier-one universities. In addition, complicated household registration rules mean that those living in China’s sprawling urban agglomerations often must support elderly parents and family members back in their ancestral or rural homes. 5. Is the hype around China’s middle class justified? While Ning’s assumptions contradict other official reporting, global multinationals who are invested in China hold faith that the country’s continuous growth trajectory means that today’s urban poor will become tomorrow’s urban affluent. In a population of well over one billion, the growth potential is undeniable. Market analysts estimate that the spending rate of the younger generation of Chinese consumers is already over 10 percent. This year, retail spending in the country is projected to increase by 7.5 percent to cross US$5.64 trillion, making China the largest retail market in the world. Given that China remains committed to shifting its economy towards value-added manufacturing, technology, and services sectors – its middle class will be making more money and will grow in numbers. This article was published by china-briefing.com. Click here to read the original.